I am a physical therapist, and I've worked for over 10 years helping people with their knee injuries and conditions. What Does a Normal Knee X-ray Look Like? In order to understand problems related to our knees, we must know what is normal. Many people return from their doctors with X-rays of their knees after being told they have arthritis. Most find it very difficult to actually see the arthritis, as they do not have a normal scan to use for comparison. Generally, when an X-ray technician takes images of a knee, they take images from multiple points of view. Later when looking at the X-rays, it can be confusing to work out which way is up and which way is down. 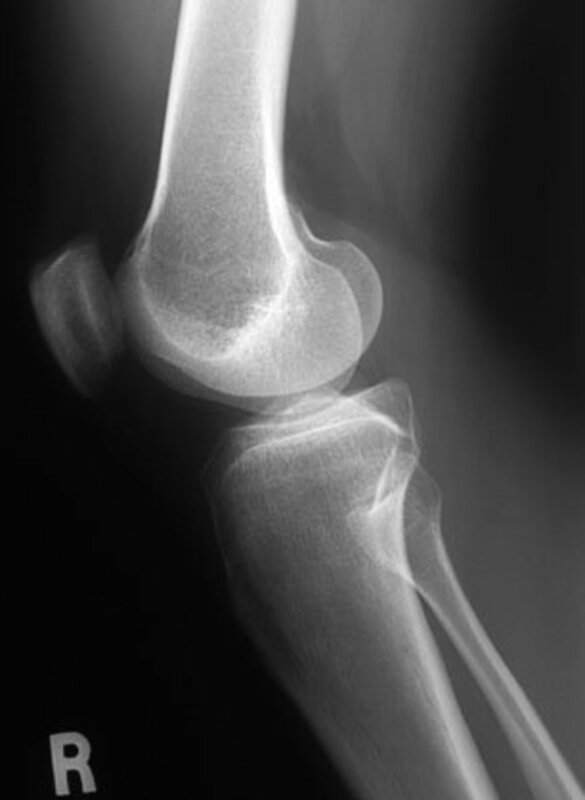 This article will show examples of the three most common knee X-ray views. In addition, I will describe the features of a normal knee. The AP view is looking at the knee, held straight, from directly in front. 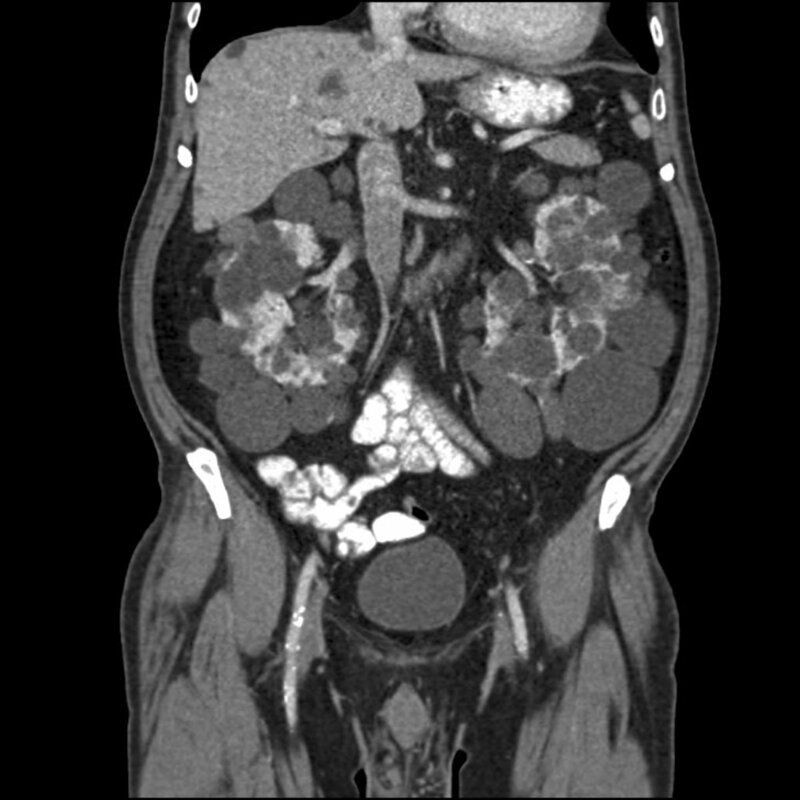 This view is generally the easiest to understand as it looks like the skeleton we are familiar with. The kneecap is difficult to see in this view as it is overlapping the thigh bone. It can only be seen as a faint outline. The AP view is helpful in diagnosing arthritis in the knee joint between the thigh and shin bones. It can also show whether there is arthritis in the inside or outside of the knee. The lateral view is taken perpendicular to the AP, showing the side of the knee. It clearly displays the kneecap and is most useful for diagnosing arthritis between the kneecap and the thigh bone. The skyline view looks between the kneecap and the thigh bone. It is taken with the knee bent (about 30 degrees) and is used to diagnose arthritis. It is much less common. Only about 30% of orthopedic surgeons use this view during a routine examination. 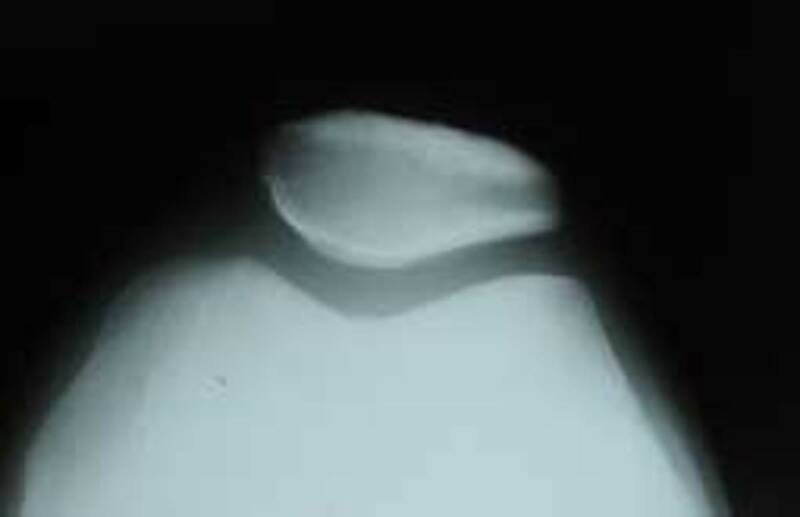 The AP knee X-ray view shows the knee from directly in front. This X-ray shows the four bones of the knee. The femur is the thigh bone. There are two bones below the joint line. The tibia is the larger bone we know as the shin. The smaller bone on the outside of the leg is the fibula, seen on the left in the above image. The kneecap can be seen as a faint circular outline overlapping the thigh bone, centered at the widest part of the femur. Knee joints are covered with smooth cartilage. This does not appear on X-rays, so although the bones are touching, they appear to have a gap between them. 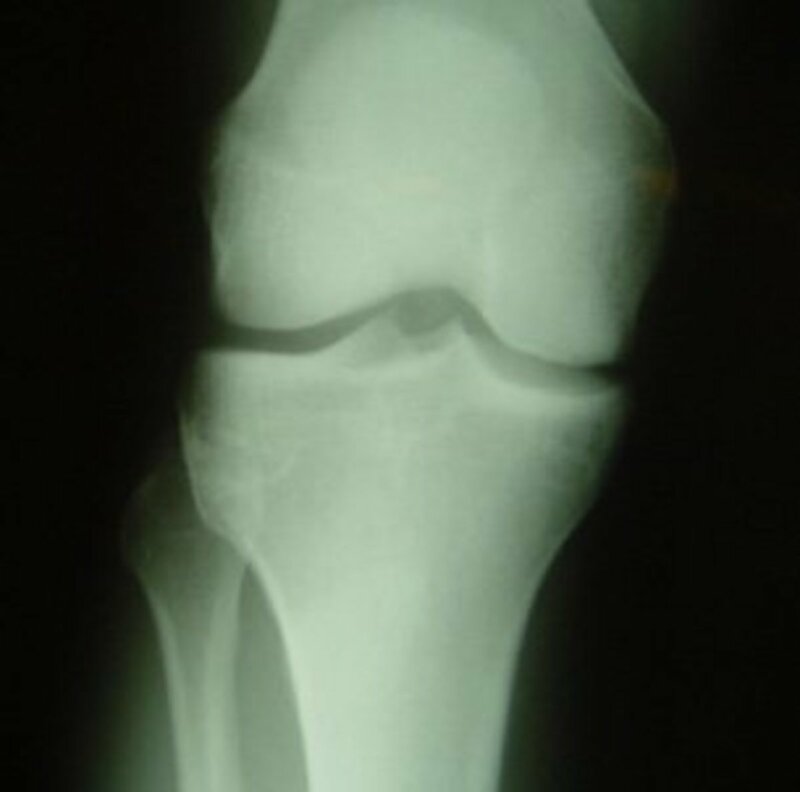 In a normal knee X-ray, the gap is easily seen and of an even height. 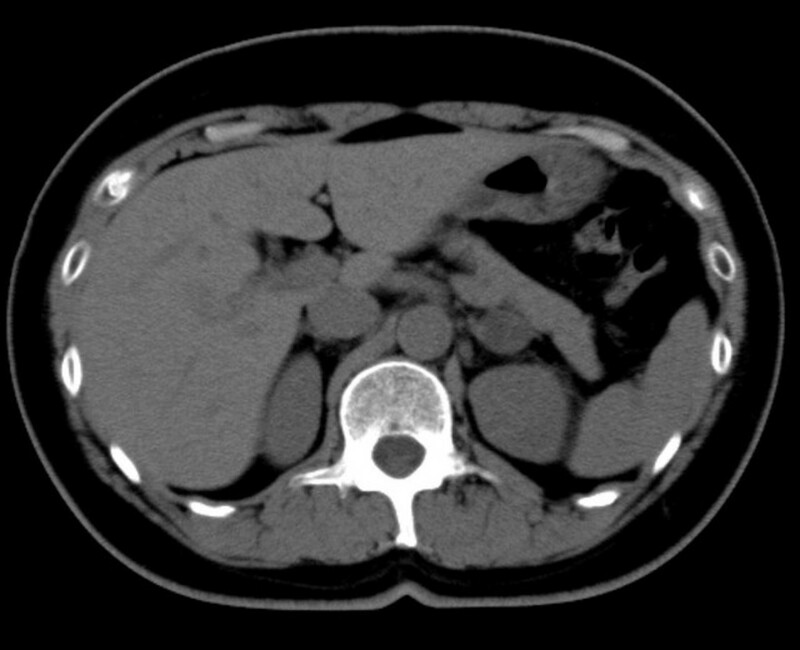 The gap appears here as a black line through the middle of the knee. A lateral view X-ray shows the knee from the side. This view clearly shows the four knee bones: femur, tibia, fibula, and patella. The patella, or kneecap, is seen sitting in front and to the left of the femur. This X-ray shows a healthy joint with nice, sharp, well-defined edges at the joint margins. This view is useful for assessing the patellofemoral joint, which is located between the kneecap and the thigh bone. The hazy outline of the calf and thigh muscles can also be seen in this view. Looking between the thigh and the kneecap in a skyline view X-ray. This view is similar to the angle you see when sitting with you leg out in front of you, slightly bent. Only two bones are visible in this skyline view X-ray: the patella and the femur. In a healthy knee, the groove in the femur should match the shape of the patella and there should be a nice gap between the two of a consistent width. With an understanding of healthy knees as a comparison, it may be easier to understand any features of arthritis or trauma. Reading X-rays is a complicated skill that requires years of experience. Armed with a little basic knowledge, however, you may have an easier time understanding what is happening to your knee so you can make good decisions for treatment. There is no substitute for the professional opinion of an experienced orthopedic surgeon. 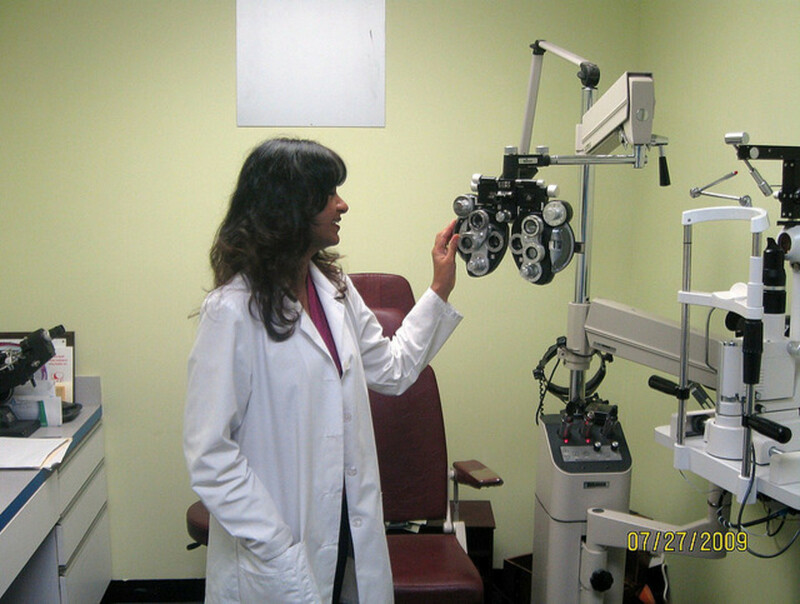 Educate yourself so you can ask the right questions in the precious few minutes you have with your doctor. I had an xray on my knee and was surprised when asked to just stand still with my knee to back of xray block i asked should i face my knee to equipment but told no was this correct? Howdy...FYI it's a Sunrise view of the Patella, NOT a "skyline" view. thank you. a lucid explanation of normal x-rays. keep it up ! You could very well have osteoarthritis. Due to the fact knee symptoms such as yours occur in many different conditions, definitive tests are required for diagnosis. A knee x-ray is a simple way of confirming the presence of arthritis. Other conditions such patellofemoral dysfunction can also result in a "grinding" sensation. Best to get yourself checked out. great Hub- things that happen at the doctors office are always so mysterious! It is nice to have a general understanding of things...it takes away some of the fear I think.